HOLLY POND – It was tough to tell who was going to pull out the win in this sub-regional matchup, but after going back and forth for 32 minutes, the Lady Broncos edged out Carbon Hill 44-43 to advance to the Northwest Regional for the first time in four seasons. 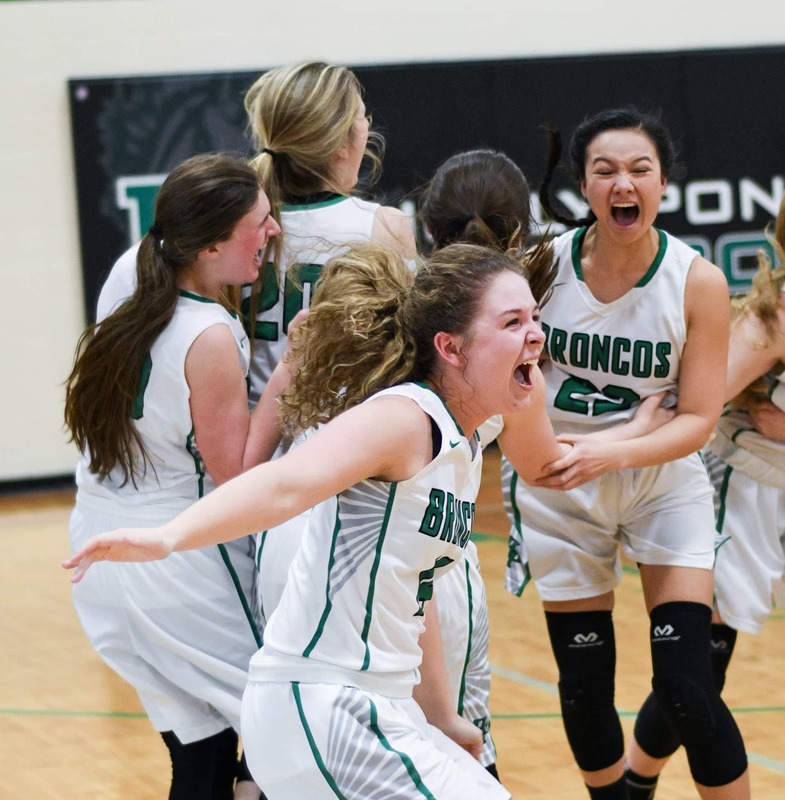 Holly Pond Head Coach Andrew Kelley has seen his team gut it out and compete for four quarters all year long, so he wasn’t surprised to see the Lady Broncos do it again tonight. Holly Pond fell behind 7-2 early in the first quarter and trailed 11-5 by the start of the second. Back-to-back scores off of turnovers from Kirsten Campbell cut the lead to 11-10 early in the second and a pair of free throws from Maddie Heatherly put the Lady Broncos on top 12-11. The run continued for Holly Pond, and a 3-pointer from Tess Duke followed by another Heatherly basket made it 17-11 midway through the second quarter. The Lady Bulldogs were able to put together a run of their own and retake a 23-19 lead late in the second quarter, but 3-point shots from Maddi Ham and Kara Hollis along with a layup from Elizabeth Miller just before the half gave the Lady Broncos a 27-23 advantage at the break. Holly Pond added to its lead in the third, stretching it to 34-25 after a basket from Duke midway through the period. The Lady Broncos led things 36-27 at the start of the final period, but the game was far from over. Turnovers allowed Carbon Hill to chip away at the lead and a pair of free throws from the Lady Bulldogs made it a 40-37 game with just under three minutes to play. Sarah Finley scored to go ahead 42-37, but a three-point play and a free throw from Carbon Hill trimmed the lead to 42-41 with under a minute to play. The Lady Bulldogs scored with 30 seconds remaining to go ahead 43-42, but Heatherly answered on the other end with a basket of her own to retake the lead, 44-43, with just 16 seconds remaining. Holly Pond had to come up with one more stop defensively and Carbon Hill’s game-winning attempt fell short as time expired, sending the Lady Broncos to this year’s Northwest Regional. Heatherly led Holly Pond with 10 points in the win, followed by Campbell with nine and Duke with seven. The Lady Broncos will be back in action on Saturday when they take on Lauderdale County. A starting time has not yet been determined. Holly Pond is playing some of its best basketball of the season and Kelley is excited to see how far that can take the team. The Lady Eagles blew past another opponent on their way to the Northwest Regional Monday night, cruising past the Lady Yellow Jackets 77-31. Cold Springs has defeated its last three opponents with ease by a combined score of 256-104 and will try to keep building on that momentum when it faces Hatton at Wallace State on Friday. A starting time has not yet been determined. The Lady Aggies led North Jackson by just five at the end of the opening quarter but put their foot on the gas after that and created some separation. Fairview built a 54-39 lead by the start of the fourth quarter and pulled away to win it 69-57 and advance to the Northeast Regional Tournament at Jacksonville State. The Lady Aggies have now won nine of their last 11 games and they have no plans of slowing down when they face Cherokee County next Tuesday. A starting time has not yet been determined. The Lady Warriors took control very early in this one and jumped out to a 22-10 lead by the start of the second quarter. West Point maintained a 38-18 advantage at the break and pulled away in the second half to win it 65-46 and advance to the Northwest Regional at Wallace State. The Lady Warriors have won nine of their last 10 and they’ll to keep things rolling in the right direction when they play Pleasant Grove at Tome Drake Coliseum on Saturday. A starting time has not yet been determined. The postseason run came to an end for the Lady Bearcats Monday night after they fell to Muscle Shoals on the road, 77-56. Cullman trailed by just six at the half, but the Lady Trojans were able to create separation and pull away in the final two quarters. The season comes to an end at 23-10 for the Lady Bearcats, but with just a few seniors graduating this spring, the future is bright for Cullman.